If you have a guest room, then I know it’s important to you to make it cozy and inviting to your guests. You want your guests to feel special. Here is my guest room and what I’ve done to it recently. Today on the podcast we’re talking about the results of a survey – What do people prefer? We cover rugs, lighting and bedding. So for example, do people like pillows chopped or not chopped? Listen below. I think it’s a great idea to sleep in your guest room at some point, so you will be aware of if the bed creaks, or the sunlight hits bed pillow at dawn. You’ll want to know if the room gets too hot or cold. A comfy mattress is really important, as well as nice sheets. I love a soft feather pillow, so please be sure you have a nice pillow in the room. You don’t want your guests to wake up with a crick in their neck. I like to have a lot of soft pillows on the bed for lounging too. A luggage rack or a bench is great place for guests to put their suitcase. I also like to have chairs in the room so they can sit to put on shoes, or read. A basket of books is another nicety for guests. Extra blankets in winter are great to have on hand. Setting up a bedside table with a lamp is helpful for people who like to read in bed. If you are so inclined, you can leave a bowl with snacks in it. That’s a nice touch. How about a nice piece of paper that tells your guests the wifi password? A few days ago I showed you this room CLICK HERE and mentioned I was looking for a little cupboard for this room to replace the very large open shelf. Here’s what I found. It’s a pine cupboard and yes it had a bottom part at one time, but somehow they got separated. I’ve got some fabric in here for future sewing projects. 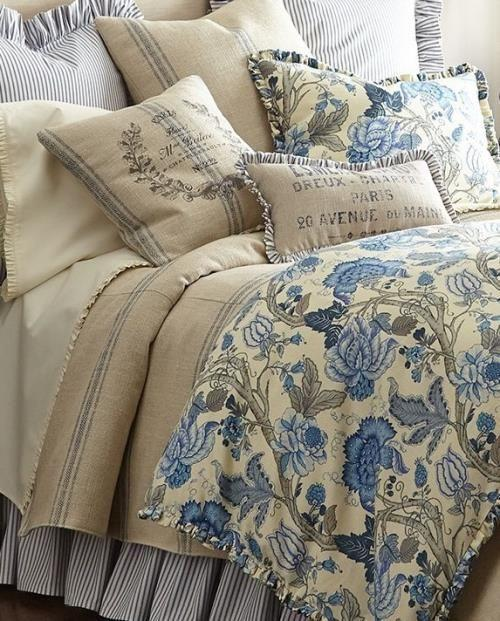 Today’s feature on our shop is this luxury bedding. It’s great quality, all sewn in the USA, and not by me. CLICK HERE. The nice thing about our guest room is that it is separate from the house, so it has it’s own thermostat, so guests can set it exactly how they like. It also has this adorable floor fan for those days when its especially hot. CLICK HERE FOR MORE INFO ON THE FAN. Of course it also has a cute kitchen, which is perfect for a midnight snack. I don’t usually show these wide angle shots, but here are a few more photos of the room, that give you a better feel for the layout. I would never want to leave, Anita! What an adorable guest suite…and of course, as always, impeccably appointed with your special touches! I love it! Lovely guest suite and the bed looks so inviting. I would love to curl up there and dream away. One would certainly feel welcome and at home in the suite. We should all be so lucky to have a separate guest suite,! Beautiful! I have a luggage rack in my guest room as well, also a desk with a chair and phone, books for reading and a basket with rolled towels, wash cloths and guest soap they can carry to the bathroom. A cheval mirror is in the corner that used to be in my own bedroom when I was growing up. The guest bedroom is my most favorite room in our house. Anyone would be comfortable in that beautiful guest suite! I might overstay my welcome! I leave a little note on the bed that says The Captain and Crew of this ship hope you have a wonderful stay. I have some throws in the room and a floor to ceiling built in bookcase filled with wonderful books. Many times my guest will come downstairs with a book in hand, having stayed up most of the night reading! The wifi code can be placed in a beautiful picture frame to make it more attractive. I also have a guest book and love to read the comments that are left after my guests leave. Cozy, all the right kind of rightness for a wonderful staycation…. I have a guest bed that I fill with down pillows for exactly your reasoning, restful, calm, and comfort. I have four on tne bed do one can nest in. A beautifully inspiring weekend to you Anita. I LOVE the hutch-turned-cabinet! PERFECT! On my first visit to my son’s in-laws’ home In the high desert), his mil had left a basket with the towels I would be using, a bottled water, a chocolate bar and a clear lip gloss. It made me feel like I was staying at a B&B. This guest room/house is beautiful! I love everything about it. LOVE the glass and wood room divider in the guest bedroom. Did u make that yourself? This is my first visit to your design blog, having gotten here from a Pin. I love French Country décor, so especially appreciated viewing your guest bedroom. I am now assembling a guest bedroom myself, thinking of a possible post retirement AirBnB future for it, and have put plenty of thought into what would provide comfort and welcome to a guest, just as you have. I placed our wifi password, actual address (versus mail address), contact info (house /cell/work numbers and emails) and emergency info (police/fire/EMS) printed on watermarked parchment, in a lovely frame adjacent to a matching tray that holds the room’s door key and our front door key on a large tassel for a keychain fob. From my memory of the most comfortable bed I’d ever slept in, found in a luxurious coastal Rhode Island B&B we visited, I purchased a down duvet (lightweight but warm for sleeping on winter nights) and a down mattress topper (to comfortably snuggle into). I also found a beautifully etched bedside crystal water bottle, the old fashioned kind- complete with a drinking glass stored upside down on it and a lipped tray for drips, so guests don’t have to go bump in the dark trying to find the kitchen. When I was at a Martha’s Vineyard B&B, anyone who was expected to come in late on the ferry had their room stocked for light breakfast and coffee/tea in bed the next morning (house breakfast was served at 7AM). I remembered how comforting that was, so I purchased gorgeous crystal for all the breakfast items- snack trays, juice pitcher, biscuit jar and a muffin/scone stand with a bell jar style cover. They’re all so beautiful and their window front location has them simply sparkling in the morning sunshine. I also set up a coffee/tea station on a mirrored lap tray holding a small antique pierced sterling coffee jar lined with cobalt glass, an adorable sterling bird adorned coffee scoop, two modern single serving size teapots with builtin tea strainers and large teacup bases with saucers, matching sugar/creamer, a selection of organic imported teas, local honey sticks, both cloth and paper napkins and a crystal single stem vase. 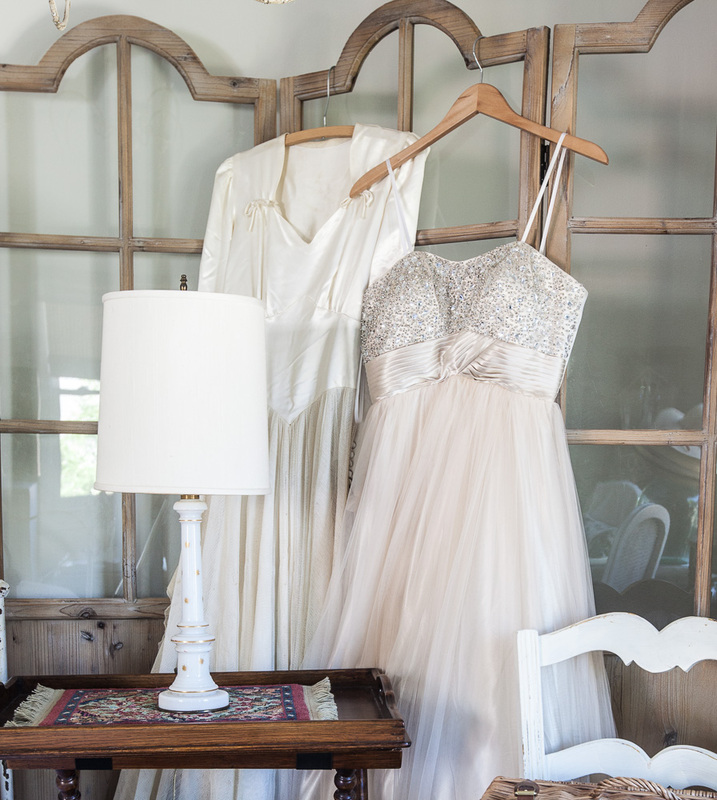 It’s a gorgeous collection and the mirrored tray only enhances its look. I built a slim, pull down, wall mount hot water/coffee station and stocked it with bottles of spring water to make coffee/tea, a small commercial coffeemaker, a filter dispenser and, when it’s open, it provides a cloth lined resting place for your cups. I purchased a set of three floating shelves with detailed moulding that I stocked with small decorative plates (for midnight snacks or light breakfast), knickknacks, sample size high end toiletries in apothecary jars, info on the local taxi service and touristy pamphlets for area attractions and churches. I purchased sample, patterned rug squares offered to professional decorators and assembled a custom 6×10 rug and 2×10 runner, contoured all around the bed for foot comfort on the hardwood floors. I placed a small, French café style seating set by the door for reading, planning day trips and having light meals at. 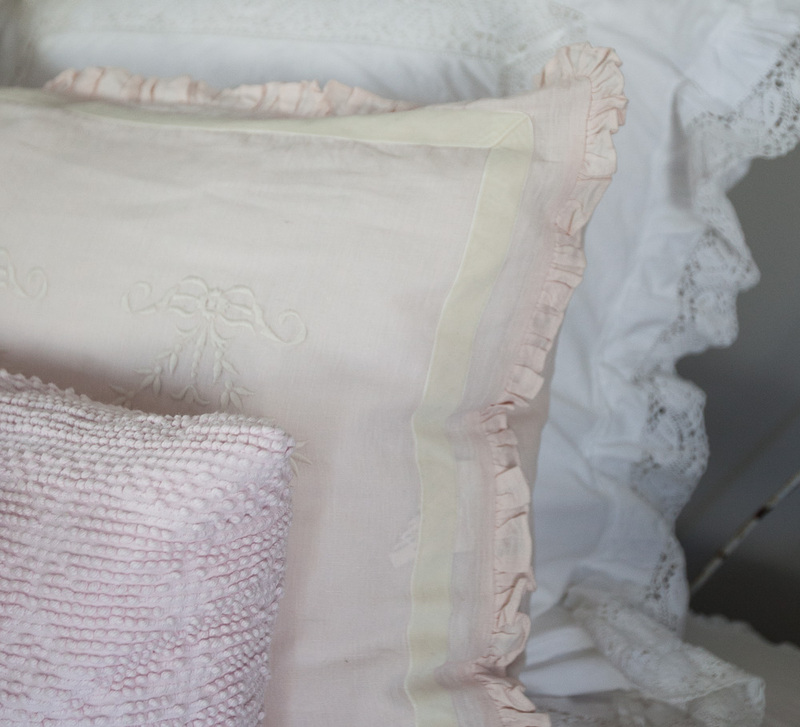 I used my collection of hand embroidered linens to generously decorate it. I placed plenty of down filled pillows and two small neck rolls on the bed, along with a daintily crocheted angora lap throw and a selection of magazines. I also purchased two white, hotel quality, ultra soft bathrobes with matching memory foam slippers for guests’ convenience, remembering when I’d forgotten a bathrobe on a trip to upstate New York in the chilly fall. I also thought to try out the room for future guests’ comfort, and enjoyed the pampering the luxurious accoutrements offered. I did end up changing out the plain shades for heavy duty, scallop edged, light blocking shades, due to the evening sun in my eyes when reading in bed and also placed a set of shoe rack shelves in the closet after I tripped over my own shoes stored bedside. I love the completed room, its comfort, all the special luxurious touches, and especially its calming color scheme. There’s only a few things I could think of to make it more perfect- a foreign location (say, the Seychelles), an attached bathroom and maid service. I can provide the maid service for guests, and eventually a private bathroom, but can only wish I had a home overseas. Thanks for sharing your lovely guest room and inspiring some décor changes in my home. I absolutely loved your stenciled (wooden?) rug (which I’m shopping for a similar stencil to try right now), the large storage basket end table (perfect for seasonal linens and blankets), the light and airy multi shelf wire display rack with the cottagey look, the pine cupboard (to think how many orphaned hutch tops I’ve passed by without a single thought!) and, most especially, the multi paned room divider with the contoured top. I also like the collected look of your guest bedroom, which I strived to do in mine also. Thanks again, for the intimate tour and the inspiration! Burma, I think your guest room sounds so dreamy! You should have plenty of guests. Love it all, Anita!! If I left now, I can be in time for lunch! Your guests are truly lucky that you take the time to make them know that they are truly special. place for guests to stay that even includes their own kitchen for anytime snacks, etc. Thank you for sharing your wonderful ideas and touches of comfort. I imagine you get an awful lot of return guests!!! A place to make a cup of tea would be absolutely wonderful. And a nap to rest weary feet after the owner takes you to her favorite shops. You had better include an alarm clock. Only kidding… Love the idea of a book basket. A happy place! Ha Sandy that’s too funny. 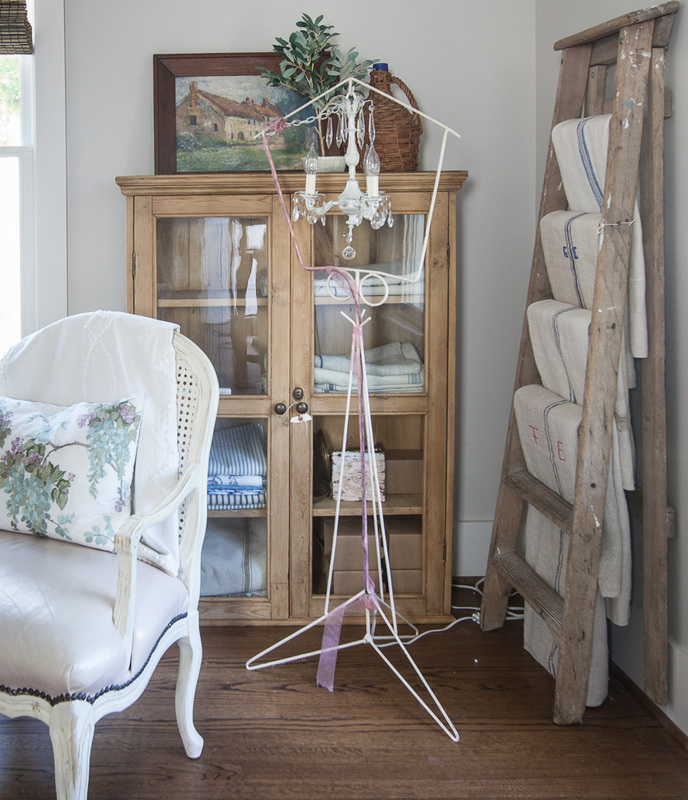 Love all your linens and how you use and intermix them! You have created the perfect haven for your guests. I would never want to leave. I like the idea of sleeping in the guest bedroom, to know what you may have not provided. I put bottled water in my guest bath, and a ‘Welcome Jim & Linda’ small sign on the bed. In a frame that says ‘On Lake Time’, I place a picture of my guests. I am loving the French influence in these rooms, I particularly love the two parlor chairs with the basket sitting in front as a table. can that basket be purchased ? Thank you for the lovely inspirations ! 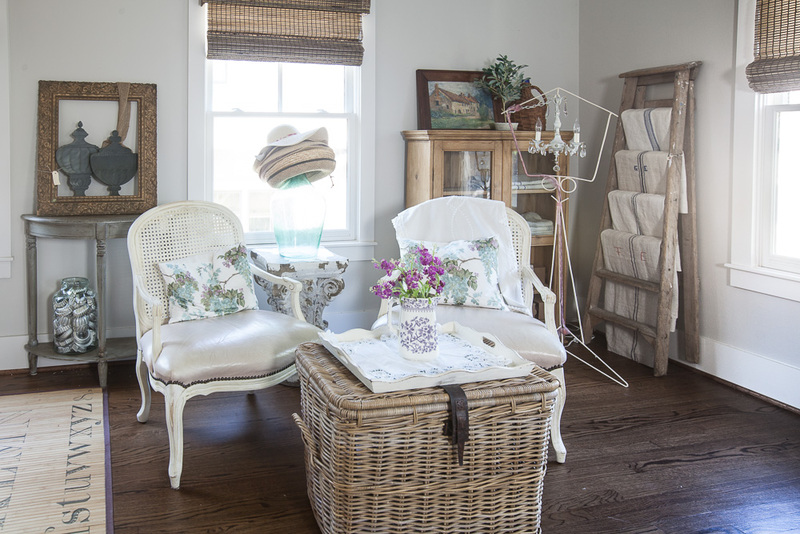 Hi Anita, love the 2 parlor chairs with the wicker basket in front ! Your guest suite looks wonderful. Anyone would feel comfortable and would enjoy their stay in that beautiful space. I love the way you’ve interspersed interesting antique and vintage objects throughout the space. Such a beautiful space! Can I come for a visit? Lovely Anita! Thanks for linking up to the Talk of the Town Link Party–you are my pick of the week! Anita, your home is sooo beautiful and comfortable! 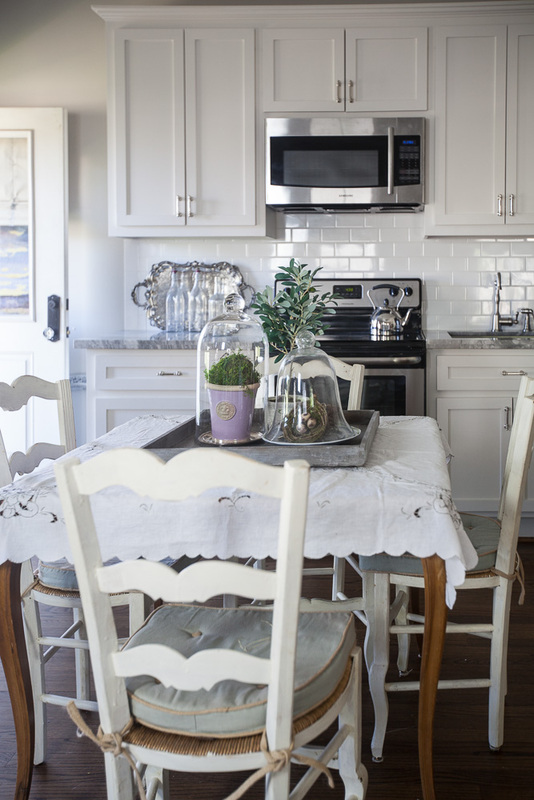 I really enjoyed your tour and the mini booklet on French Farmhouse Style when I signed up. 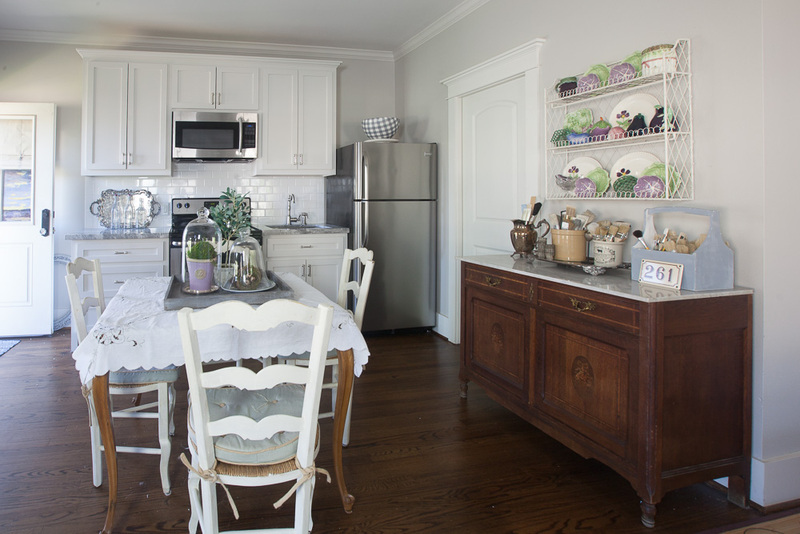 I love French furnishings, too, and have a few pieces in storage still in California. We just moved with my husband’s job to Texas this past fall and I have managed to bring a little French country style here in our “portable home,” our 41′ fifth-wheel trailer. This past week, I found a little cabinet that has a French look and will be painting it soon. It just fits where we need something to hold our printer, although it will lose the printer sometimes when I need a decorating fix! 😉 Thanks for a pretty “post-fix” and it would be fun to win a copy of your book! Thank you. Thank you Barbara! Sounds like a gorgeous piece. Love your guest suite, feels like light and airy and would be very comfy! My two guest rooms, aka children’s old rooms still have a lot of their “stuff” in them, although they don’t live at home anymore. Hopefully one day I can make them into works of art like yours!! Love your guest suite and all the welcoming touches. It is very inviting. I always forget about our guests needing the Wifi password and I love your suggestion. We have two guest rooms and my favorite thing to do is wash the sheets with a dreamy fresh scent and place them on the bed the day my guests are to arrive. Beyond that I have a stack of thick bathtowels, current magazines and a beautiful soap and some lovely fresh flowers. Great post! Lots of really good ideas. Oh Gina, I want to visit your home! 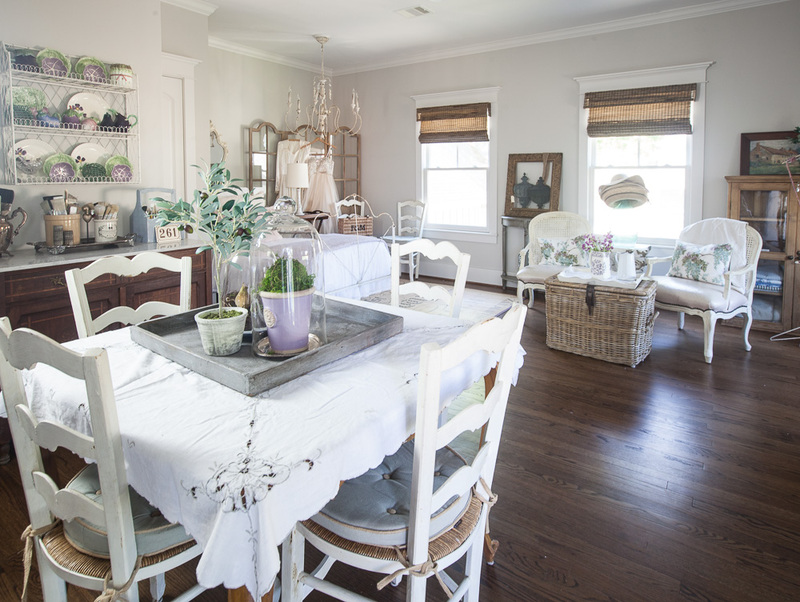 Love your guest quarters and know it would be very difficult to leave. Also love the wide shot photos you included this time and seldom offer. These photos give a much needed perspective to your beautiful home(s) and provide us with suggestions for room arrangement and to enjoy the relationship between diverse areas. Oh, btw, I always include at least a small vase of fresh flowers to my guest room, even in the winter (thank you Trader Joe’s), and that always seems to bring a smile and a compliment. Such a beautiful guest room. I would love to know what that wood dining table looks like and also those gorgeous cane seat chairs without the cushions!